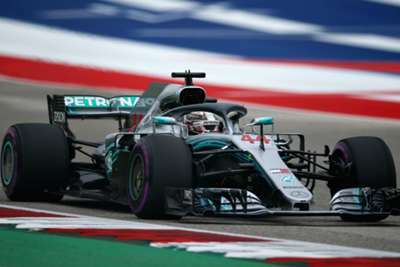 Lewis Hamilton will have the ideal opportunity to wrap up the Formula One world title with three races to spare after smashing the track record en route to qualifying on pole position for the United States Grand Prix. The Briton, who has won four straight races, will retain his championship if he triumphs in Austin on Sunday and rival Sebastian Vettel places third or lower at the Circuit of the Americas. And in a dramatic finish to Q3, Hamilton posted a sizzling time of one minute and 32.237 seconds on his final flying lap after briefly being pushed off top spot by Kimi Raikkonen. Ferrari rival Sebastian Vettel was second quickest in the session with his final effort, but a three-place grid penalty for failing to slow down sufficiently under red-flag conditions during Friday's first practice session in wet weather means he is fifth on the grid. Perhaps crucially for Hamilton, Mercedes team-mate Valtteri Bottas will start in third meaning Vettel will have to pass the Finn, Daniel Ricciardo and Raikkonen to seal the minimum second place he needs to extend the title race. For Hamilton, victory in America has become a familiar feeling with the four-time world champion having won in Austin in five of the past six years. Further down the grid, Max Verstappen will start in 13th after a mechanical issue sustained after riding a kerb in Q1 curtailed his qualifying session. It would have been worse for Verstappen, but penalties imposed on Toro Rosso duo Pierre Gasly and Brendon Hartley meant that he will be bumped up two spots on the grid.